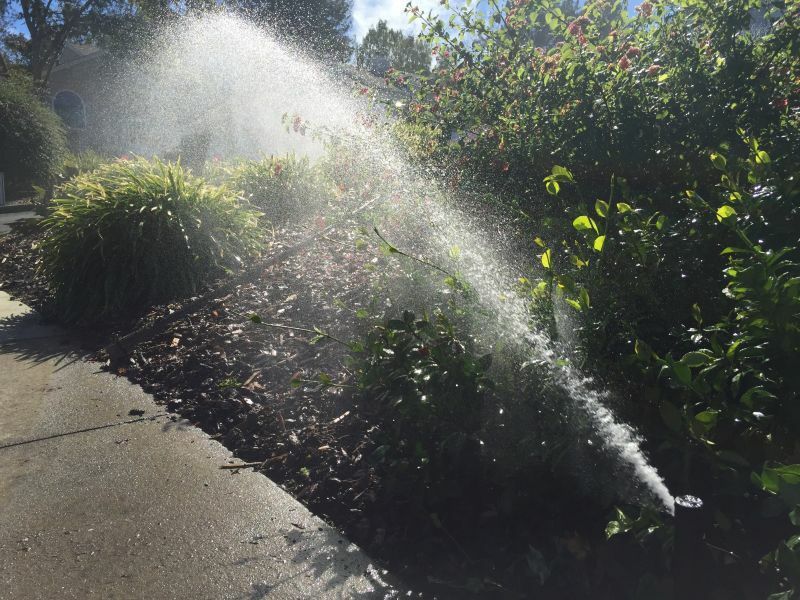 Heat is a brutal enemy to water conservation. Officials say the unusually high temperatures in October threw a wrench into water savings, the statewide conservation rate slipping to 22.2 percent, measured against the same month in 2013. It was the first time in five months that urban water savings statewide fell short of Governor Jerry Brown's 25 percent conservation mandate. Hover over the colored dots to see how individual water agencies are performing under the state's assigned conservation quotas. Still, the state's top water regulator called it "pretty good news." Felicia Marcus, whose State Water Resources Control Board oversees conservation efforts says she's "relieved," given how much worse the numbers could've been. Water board staff scientist Katy Landau called October, "a bit of an odd month," wetter than October in the base year of 2013, but also 7 degrees warmer on average, statewide. The warmer the weather, the harder it is for homeowners and businesses to resist starting up the sprinklers. 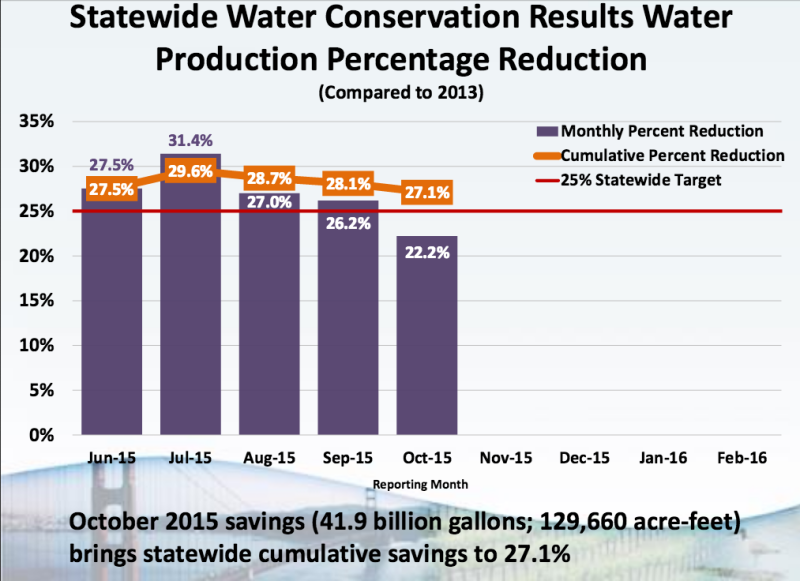 Overall, however, records supplied by more than 400 water suppliers around the state show that California is on track, with unprecedented water restrictions having reduced cumulative water consumption by 27.1 percent, still ahead of Brown's 25 statewide mandate. In Northern California, water agencies in Contra Costa County, Pleasanton and Livermore were lauded by regulators as standout performers, all being at least 10 percent ahead of the conservation quotas assigned to them by state officials. Throughout the five months that the mandatory conservation program has been in place, Landau says that Californians have managed to save a volume of water large enough to supply one year's worth of the residential needs of San Diego and Sacramento Counties combined. Regulators have sent "conservation orders" to some laggard agencies. Among those, Landau says most have shown improvement, but eight out of nine are still falling short of their assigned savings marks. The sweeping array of emergency drought restrictions that Brown put in place in the spring, run through February, though they can be extended "if drought conditions persist" through January. Marcus says, "They will," regardless of how much precipitation the state gets in the meantime. As if to underscore the point, on Tuesday officials told cities and farms served by the State Water Project to expect 10 percent of their hoped-for water deliveries this coming year. This is only the "initial allocation," and could well be revised upward if California has the wet winter that's been predicted.